As major organisations depart, what's next for Blizzard's MOBA? It’s tough being the underdog. Blizzard have learned that the hard way over the past year: where their previous games have often been quickly praised as the highlights of a genre, Heroes of the Storm wasn’t received quite so well. Which isn’t to say that it was received badly, exactly, but when it joined a genre led by the two biggest esports out there, it was always going to face an uphill struggle. A year on from Heroes of the Storm’s official release—a year of success, mistakes, and improvements—how well is Heroes of the Storm doing in the world of professional gaming? 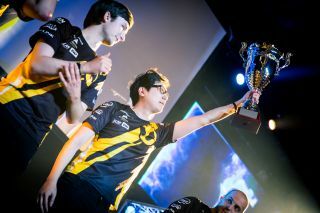 Given Blizzard’s esports pedigree, how does Heroes of the Storm hold up? Among esports organisations there was a rush to get in on Heroes of the Storm in 2015. It was the new MOBA on the block, with Blizzard’s power behind it, and the promise of rewarding competition with Blizzcon on the horizon. Big names—MVP.Black, Cloud9, and EDward Gaming—and teams of friends rushed into the queue. Even YouTubers got involved, with Jesse Cox (aka Shaboozey) putting a team together called Stellar Lotus. The success of Hearthstone as both a casual game and esport was a good sign that Blizzard would not just support the game, but give Heroes of the Storm a bit of professional polish. It certainly wasn’t all sunshine and roses, though. It was evident that, while Heroes of the Storm fits its niche of a simple but deep alternative to League of Legends and DotA, it didn’t successfully show itself off to onlookers in an esports setting. One of the game’s core changes to the MOBA formula, replacing items with talents that are gained at level increments rather than through accumulating gold, was hard to demonstrate to a spectator—especially as some talents had nigh-identical images despite having dramatically different effects. Since then, the UI has improved greatly over multiple iterations, making it much clearer exactly what talents have been chosen. The accessibility of Heroes of the Storm as an esport is an area where real progress has been made. The game even appeared on ESPN, and the current presentation is one clearly inspired by traditional sports broadcasts—particularly Josh ‘JHow’ Howard’s analysis of key moments. Uploading all past games to YouTube along with regular tournaments and a strong roster of professional casters have all helped to boost Heroes of the Storm’s profile after just one year—and that’s without seeing how the game will fare at Blizzcon in a few months. There’s one other key element to an esports scene, however: players and their teams. That’s the area where Heroes of the Storm has the most issues. The biggest prize pool in any Heroes of the Storm tournament so far was $500,000 at Blizzcon 2015 and the first place prize went to Cloud9 after going 3-0 in a best of five. They won the tournament decisively and deservedly. Towards the end of 2015, Cloud9 were seen as one of the teams to beat, at least in the western side of the scene. This carried on into 2016, but after March things took a turn for the worse. Cloud9 lost out in the group stages of both the Heroes of the Storm Spring Global Championship and the Heroes of the Storm Summer Regional Championship, meaning they did not qualify for the Heroes of the Storm Global Championship. This wasn’t the first major team to disband, however, as Natus Vincere (commonly known as Na’Vi) split in April 2016. This also followed a period of regular losses, and the announcement placed the blame on their recent poor performance. In fact, there’s a lot of names you’ll recognise in the list of teams that have left Heroes of the Storm’s professional scene. compLexity, G2 Esports, and Edward Gaming have all thrown their names into the hat only to pull them back out. These are teams that have a history of doing well in other esports, fielding rosters that perform at a decent level—and they’re dropping like flies. Heroes of the Storm has professional backup, reasonable prize pools, and Blizzard behind it trying to make things better. So why so many departures? The most regularly cited issue is poor performance, although considering the game was only fully launched just over a year ago, that’s a curious claim. In what other sport would an entire team shut down after a few months of poor performance? Esports can be unstable, but some teams just don’t seem to have the drive to stick with Heroes of the Storm. The fact is, however, that teams are not seeing a financial benefit to sticking with Heroes of the Storm as an esport. It’s easy to forget that for the managers and owners of esports teams this isn’t a game at all, or even a sport: it’s a business. Competition comes second to financial success, for most. Despite the problems, however, these departures have made for some captivating events and enthralling games: because Heroes of the Storm’s professional scene is now filled with amateurs. One of the defining events of Heroes of the Storm’s run so far has been Heroes of the Dorm. This wasn’t a tournament for professionals, but for amateurs at college around the United States to form teams together with the aim of winning the grand prize, a scholarship worth up to $75,000. Unfortunately this event was limited to the United States, but the message was clear: the tournament scene in Heroes of the Storm is for a broader community of players than just the professionals. Cal Berkeley won in 2015, and Arizona State won in 2016. Two of Arizona State’s players have gone on to play professionally with Gale Force eSports, finding success there. This isn’t the only example. Bob Ross Fan Club—yes, that’s their team name—rose to fame after beating world champions Cloud9 at Heroes Rising, a crowdfunded Heroes of the Storm tournament. It was full of drama, too, as Bob Ross Fan Club managed to claw their way into the final through multiple loser’s games after being knocked out by Cloud9 way back in the quarter finals. The final went to the final game in a best of five, right down to the wire. In an interview with Red Bull, Bob Ross Fan Club player Ken ‘Kenma’ Buechter said “You don’t play esports if you’re looking to get rich. If I was in this for the money, I would not be doing it.” For him it’s a load of fun, and a satisfying endeavour. Bob Ross Fan Club were eventually picked up by Team Naventic, and have since gone on to come first at Dreamhack All-Stars in Austin, as well as come second in 2016 ESL North America Summer Regional Championship to, guess who, Gale Force eSports. Please Buff Arthas, another brilliantly named team (especially as Arthas received some significant buffs during their rise to fame) developed outside the realm of the big players in esports. The team rose out of the ashes of G1A, and raised eyebrows when they won the Heroes Global Circuit Summer Taiwan Regional this year. This is exactly where the Heroes of the Storm esports scene shines, brighter than it ever has before. The premise of the game, to boil down MOBAs to their essence and create a far more approachable experience, extends to its esports side. It’s certainly not perfect, and the game has a long way to go before you’ll see it on a screen in your local bar. But Heroes of the Storm is foregoing appealing to the big names in favour of honing new talent, on raising people up. Things are also getting better in terms of diversity. Jaycie ‘Gillyweed’ Gluck is a regular host and caster at events, and the team mYinsanity have dedicated themselves to supporting a second team full of women, aimed at bringing a bit of positive change to the boy’s club of professional gaming. After a year, Heroes of the Storm is finding its feet as the initial hype has died down and the most talented players have started to prove themselves. It’s going to be hard to see where exactly the professional scene will go in the near future, but with regular incentives for amateurs such as the Heroes of the Dorm tournament or success stories like Bob Ross Fan Club, it’s hard to imagine Blizzard won’t focus on fostering more grass roots talent. The Heroes of the Storm esports scene is still in a precarious place, and one that unfortunately results in some lower numbers for viewership. Given support and time, however, it has a chance to grow into something that doesn’t just entertain, but celebrates competition for competitions’ sake.